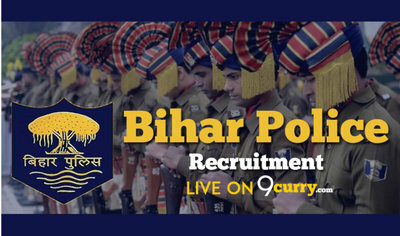 Bihar Police Result 2019: Below are the latest results published by Bihar Police - Bihar Police / www.bpssc.bih.nic.in. The recent result announced by the organization is PSI Cut Off Marks 2019. BPSSC PSI Cut Off Marks 2019: Bihar Police Subordinate Services Commission (BPSSC) has announced the Result on 15 Apr 2019 for the exam . BPSSC Bihar Police SI Final Result with Marks 2019: BPSSC has announced the Result on 12 Apr 2019 for the Bihar Police SI Exam 2018. BPSSC Steno Assistant Sub Inspector Result 2019: Bihar Police Subordinate Services Commission (BPSSC) has announced the Result on 06 Apr 2019 for Steno Assistant Sub Inspector Exam 2018 which was conducted on 26 Aug 2018. BPSSC Bihar Police Steno ASI Mains Result 2019: Bihar Police Subordinate Services Commission (BPSSC) has announced the Result on 02 Apr 2019 for BPSSC Bihar Police Steno ASI Exam 2019 . BPSSC Bihar Police Sub Inspector Final Result 2019: Bihar Police Subordinate Services Commission (BPSSC) has announced the Result on 09 Mar 2019 for the exam . Bihar Police SI Final Result 2019: Bihar Police has announced the Result on 09 Mar 2019 for Bihar Police SI Exam 2019 . 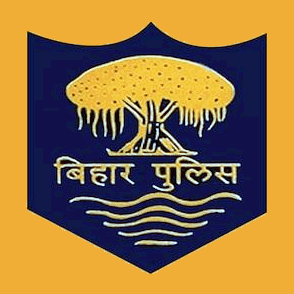 Bihar Police Driver Constable & Fireman Driver 2018 Final Result 2019: Bihar Police has announced the Result on 11 Feb 2019 for Bihar Police Driver Constable & Fireman Driver 2018 Exam . Bihar Police Constable 2017 Result: Bihar Police has announced the Result on 28 Nov 2018 for Bihar Police Constable Exam 2017 . Bihar Police Driver Constable & Fireman Driver Result 2018: Bihar Police has announced the Result on 12 Nov 2018 for Bihar Police Driver Constable & Fireman Driver Result 2018 . Bihar Police ASI Steno Pre Result 2018: Bihar Police has announced the Result on 06 Sep 2018 for ASI Steno Pre Examination 2018 which was conducted on 26 Aug 2018. Bihar Police Driver Constable Result 2018: Bihar Police has announced the Result on 20 Aug 2018 for the exam . BPSSC SI Mains Result 2018: Bihar Police Subordinate Services Commission (BPSSC) has announced the Result on 06 Aug 2018 for SI Mains Exam 2018 . Bihar Police CSBC Bihar Constable Final Result 2018: Bihar Police has announced the Result on 11 Jun 2018 for CSBC Bihar Constable Exam 2017 . Bihar Police SI Result 2018: Bihar Police has announced the Result on 05 May 2018 for Police Sub Inspector, Constables Exam 2017 . Bihar Police Lady Constable Result 2018: Bihar Police has announced the Result on 03 May 2018 for Lady Constable Exam 2017 . Bihar Police Female Constable Written Exam Result 2018: Bihar Police has announced the Result on 06 Feb 2018 for the exam . Bihar Police Constable Written Exam 2017 Result 2018: Bihar Police has announced the Result on 03 Feb 2018 for 9900 Constable Posts for which Written Exam was conducted on 15 Oct 2017 and 22 Oct 2017. Selected candidates needs to participate in Physical Evaluation Test (PET). 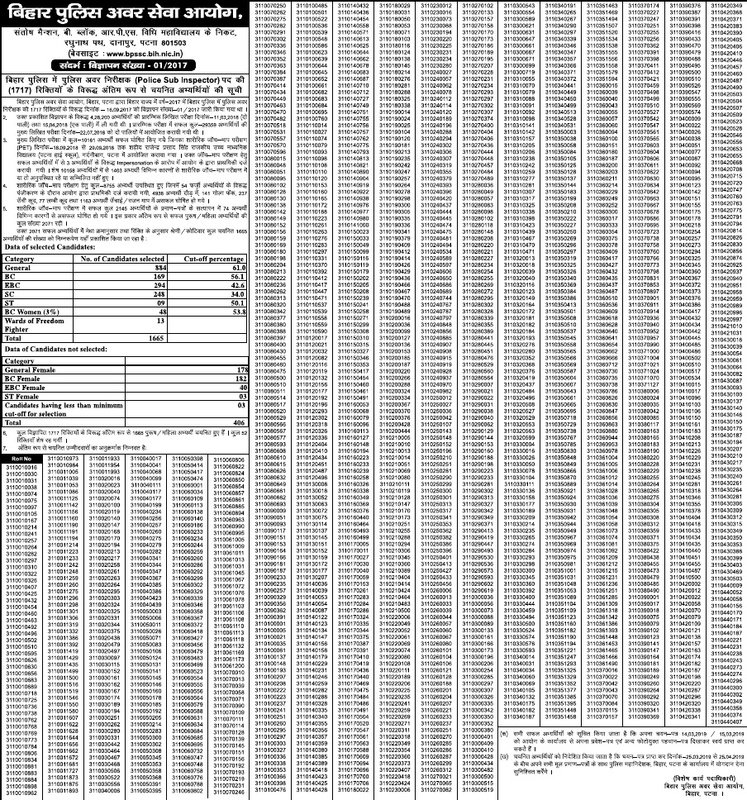 Bihar Police has announced the Result on 22 Aug 2017 for the exam .